Clockwork Briefcase is the award winning electronic bomb defusal game I am currently working on. 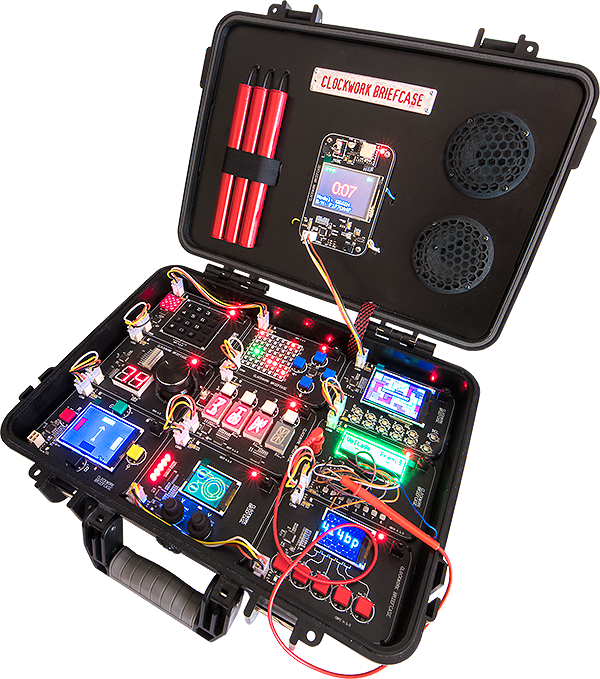 It is a cooperative multiplayer game which simulates a real electronic bomb in the briefcase. The basics of the game are as follows: one player is faced with a ticking bomb, and knows nothing about how to deactivate it, while the other player, who is playing the role of bomb defusal expert, has the defusal instructions in his hands, printed on paper, but he/she cannot see the bomb. The key to solving this puzzle is in communication between the players. The player that can see the bomb has to explain what he sees, for example, what are the param-eters are on the displays, and the player who is the "defusal expert" has to use this infor-mation to interpret the rules and to instruct him as to what to do – for example which wire to pull out, or which password to type in, etc. After the last module is deactivated, the timer will stop ticking and the bomb will be defused. If a mistake is made, or if the time runs out, the game ends. Each of nine modules represent a different game. Some modules contain more than one game. All puzzles are procedurally generated, which guarantees practically infinite number of variations to ensure that problems and solutions will be different each time. The prototype was finished in April 2016 and its premiere was at the Reboot Develop 2016 games developer conference, where it became an instant hit. Wherever we came the media went crazy! It is hard to find TV station, portal, magazine or newspaper which did not feature the Clokwork Briefcase.